The best hula festival around is back again! 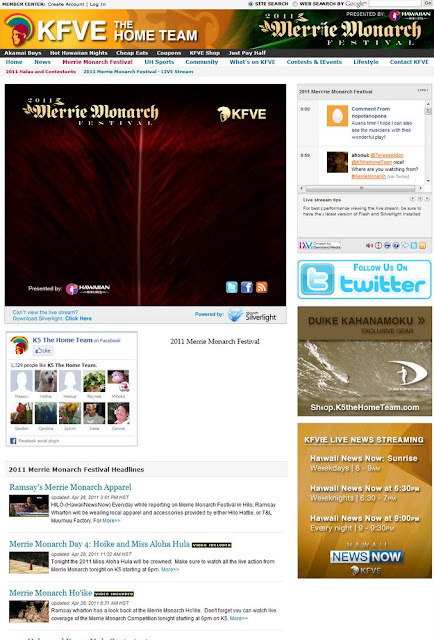 Go to KFVE to watch the live stream by clicking here. A snapshot of the KFVW webpage. You have really got to see these talented chanters, dancers, and singers. It is amazing. What a great afternoon with family and friends we had yesterday! Thanks to all of you for a special day. We finally got to debut our mandarin chicken, and lemon chicken recipes as well now on : upcountryrecipes.com, or recipe blog.